No matter how many storm clouds swirl around the production of Celtic Thunder, they keep rolling on. Founding father and legendary composer Phil Coulter has flown the coop, Damian McGinty went to Hollywood to get mileage out of his stint on Glee, and Paul Byrom has amassed his own following with last year’s excellent solo album This Is the Moment. Yet the wildly popular group has managed to hatch another chapter in Voyage, their eighth album. Old stagehands Keith Harkin, Ryan Kelly and George Donaldson are now joined by Neil Byrne, Emmet Cahill and Daniel Furlong. Cahill, 21, was awarded the 2010 John McCormack Bursary for the most promising young tenor, was named the most promising young singer at the Royal Irish Academy of Music and was a multiple prizewinner at the National Feis Ceoil singing competition in Ireland. He hails from Mullingar, Co. Westmeath. Furlong is the youngest member of Celtic Thunder. He is only 13 years old and hails from Taghmon in Co. Wexford. He is a boy soprano and was discovered when he entered a singing competition at the age of seven and won! He has been part of Wexford’s renowned Opera Festival every October and played the role of Edgar in the Wexford Light Opera Society production of Ragtime in 2008. He gets his solo turn on “Over the Rainbow,” and his high child register takes the song to dizzying heights. If you close your eyes and didn’t know any better, you’d swear you were listening to a track from Celtic Woman instead of Celtic Thunder. Since this is also a show, founding producer Sharon Browne ably guided McGinty’s character through the brambles of puberty. Let’s hope she does it again with Furlong because his voice is pristine! I must confess that there are certain people in the Irish Voice and Irish Central.com offices that roll their eyes and tease me mercilessly each time I turn in a column about one of these big shows, but hear me out on why these are guilty pleasures! I have always applauded this show in particular for taking their high wattage spotlight on PBS appearances and shining it on obscure Irish songwriters. Included on the disc is a spirited live version of “Seven Drunken Nights” by the ensemble. Presumably, Furlong sipped soda through the whole performance! In other Celtic Thunder news, the organization behind the show peeled off some of McGinty’s best bits and put them into an exclusive EP on iTunes. If you can’t get enough of his rendition of “Puppy Love,” fire up your laptop and download away! 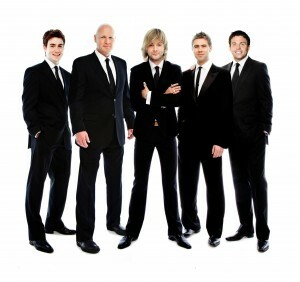 For more information on the show, log onto www.celticthunder.ie.